In 1853 the French La Nouvelle Magie Blanche Dévoilée by Jean Nicolas Ponsin was published. 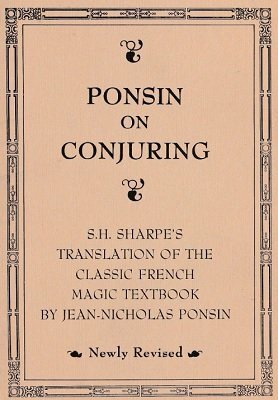 It was the first book to explain exactly how the leading magicians of the day in France performed their most prized effects. Sam Sharpe translated it to English and Wilf Huggins added a couple of clarifying illustrations. This ebook is filled with intriguing effects with cards, coins and an entire section on the Cups and Balls. Surprisingly you will find here the idea of using metal balls, the same idea with which Paul Gertner created a sensation. You can find everything from mental miracles, to impromptu effects, routines with dice, watches, handkerchiefs and so much more. Second printed edition 1987, 177 pages. Digital edition 2014, 77 pages (newly formatted). If you want to know WHERE the effects of today came from then you would find none better than this little Gem. If you want to be the best in what you do then the History of your subject should be the first step on the road. Take this walk through time and Enjoy.